Ha! That'll teach 'em to have the same launch day as me! Well that's two down, are there any other would be super heroes? Vinny Mac Renda: ...And yet Batman fans STILL think Superman has no chance. Let's see you do this Batman! Lois: Stop writing fanfiction, Jimmy, no one in their sane minds would publish this. Marvel: Where all weapons are boomerangs. Great guns! Look at all these rips in my suit. I sure wish I had some Kryptonian armor. 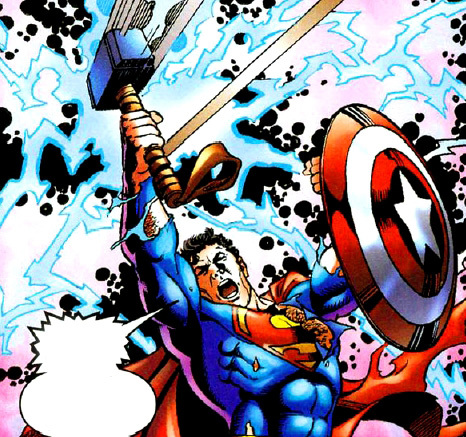 That depressing day at DC Comics headquarters when they found out that even Superman loved the Avengers movie. Chad couldn't decide if he should go as Superman, Captain America, or Thor for ComicCon so he decided to go as all three. Then he got beat up by the angry fan boys outside Hall H. Don't be like Chad. The hammer comes back! The shield comes back! How do I get rid of this junk? Superman loved playing Superhero Monopoly, but he could never choose between these two tokens.